Completing the lineup for IndyCar racing's largest team, the four-car effort of Andretti Autosport declared American open wheel driver Ryan Hunter-Reay the newest teammate to Danica Patrick, Tony Kanaan and Marco Andretti. 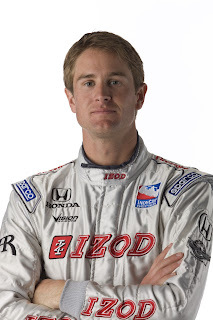 The 30 year-old Hunter-Reay's place with Andretti Autosport's #37 team had all-but been officially announced since 2009 team driver Hideki Mutoh was released at the conclusion of the season. Starting his racing career through the Skip Barber Racing School and Barber Dodge Series, Ryan Hunter-Reay first step into the big-time open wheel racing resulted in 2003 when he drove for the short-lived American Spirit Team Johansson in the Champ Car series. Paired by the seasoned past champion Jimmy Vasser, Hunter-Reay ended his rookie campaign with a victory at the Surfers Paradise round in Australia. Also winning a 2004 win at the Milwaukee Mile on the Champ Car tour, his talent has also translated to the IRL IndyCar Series. After Ryan Hunter-Reay locked a full-time ride Rahal Letterman Racing, he took the Indy 500 rookie of the Year honours as well as his first IndyCar series victory at Waltkins Glen. Competing in the entire 2009 IndyCar series schedule, Ryan Hunter-Reay's year started behind the wheel of the Vision Racing team with a season's best 2nd place run in the maiden race at St Petersburg. However, while the season started well with Vision Racing, the following rounds in the 2009 IndyCar Series failed to net even top-10 results through to Texas Motor Speedway race in June. For the next race in Iowa, Hunter-Reay was granted leave of Vision Racing to replace the injured Vitor Meira at AJ Foyt Racing. A 7th place at the Honda Indy of Toronto in July and the 4th at the Mid-Ohio Sports Car course in August were positive improvements but could not alter a 15th place finish in the 2009 IndyCar Series points standings. With Andretti Autosport (last year known as Andretti-Green Racing) going winless for 2009, the team's entire driver lineup has to break the Penske and Chip Ganassi brigade going into 2010. Ryan Hunter-Reay has a habit of being the unexpected underdog who has allowed has talent to show at just the right time to catch even the most established teams off-guard.